Nuts-almonds, peanuts, walnuts, pecans etc-have more or less gotten the axe as far as healthy foods are concerned. The overall consensus is that they just get you fat, because after all aren't they loaded with oodles of fat! But all fat is not created the same. Some of it is actually good for you in the right amounts. 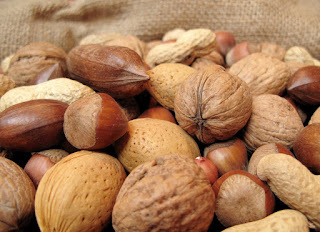 Yes off course nuts has fats, but much of it is monounsaturated fats, the type which is actually good for your health. Olive Oil, which is considered a heart healthy choice, contains a large portion of monounsaturates. In addition to healthy fats, nuts generally contain high amounts of protein, fiber, antioxidants, and various vitamins and minerals. They pack a high ‘nutrition punch’ in a small package. Each type of nut also has additional benefits unique to it like walnuts which have a higher amount of Omega-3s than other tree nuts and peanuts. Also nuts are easily added to many dishes, to sandwiches in the form of various nut butters (the most popular being peanut butter off course), and are portable. The essential thing to consider when incorporating nuts into the diet is to have some type of guideline. In this case it is 1 or 1.5 ozs (a handful) nuts per day, an amount confirmed by the results of several recent studies. An ounce of nuts contains anywhere from 160 to 200 calories. What does this look like? Here is a breakdown of commonly consumed nuts. This information is not intended to have you beginning to count your nuts like pennies, but to give you some type of visual of the 1-1.5 ounce a day guideline. A sensible, closed handful of nuts should yield something close to quantities noted above, so that you can reap the health benefits of nuts while not going overboard. Off course, it’s a whole different issue if you are allergic, which many people are. But if you can enjoy nuts and you are avoiding them, why deprive yourself? Eating what you want with just a bit more awareness and knowledge of your food beats deprivation any day.